For 125 years, Watauga Avenue Presbyterian Church has been an important presence in the Tri-Cities and beyond. By 1785 the Presbyterian Church was well established in the Upper East Tennessee area. During the latter part of the 1800s, the issues of slavery and the federal union became points of division between some Northern and Southern congregations. In 1861, this led to many Southern Presbyterians congregations splitting off from the predominant United Presbyterian Church in the U.S.A. (UPCUSA) and forming the denomination that would eventually become the Presbyterian Church in the United States (PCUS). However, many areas of the South remained loyal to the Union, and those Presbyterian churches continued to be part of UPCUSA. 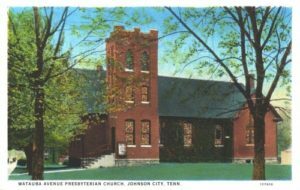 In 1892, when a small group of Presbyterians in Johnson City wanted to organize a new church, the group expressed a desire to be associated with UPCUSA as well. For the first two years, Watauga Avenue Presbyterian Church services were held in local school buildings. In 1896 a small brick chapel was built and dedicated at the corner of Watauga Avenue and New Street. The first addition to the building was a bell tower, and each Sunday the bell rang before services. Over the years, women have been important to the church, not only within the organization but also in the community of Johnson City. Three female members of the Watauga Avenue Presbyterian Church were among the charter members of “The Ladies Reading Club,” a group that started the first library in Johnson City. 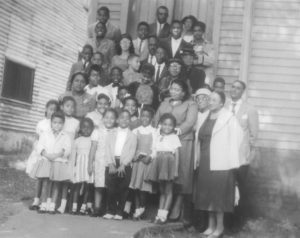 In 1899, the Bethesda Presbyterian, a predominantly African-American church was established in Johnson City. 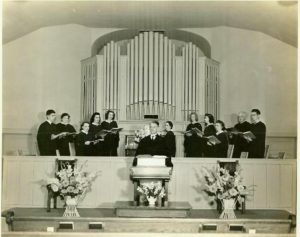 However, in 1966, members of Bethesda Presbyterian Church experienced a decline in membership and were unable to support a full-time minister. The leadership of both Bethesda and Watauga Avenue churches agreed a merger of the two congregations was the best solution. Bethesda members were invited to join Watauga Avenue Presbyterian, and 26 accepted. In 1969-70, a new sanctuary was constructed, and this is the sanctuary that is still used today by the church. In 1983 the UPCUSA and PCUS reunited under the name of the Presbyterian Church (USA), and today the Watauga Avenue Presbyterian Church is a member of this denomination. In 1992, Watauga Avenue Presbyterian Church celebrated its 100th anniversary, and in 2017, the church celebrated its 125th anniversary.